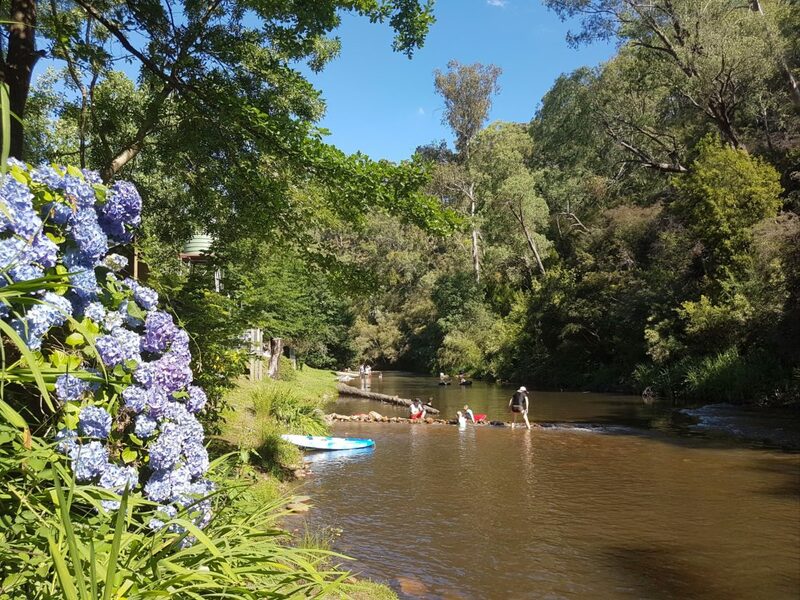 Jamieson Caravan Park is located on the banks of Jamieson River in the Victorian High country. Set on six beautiful acres of park-like gardens, Jamieson Caravan Park is the ideal spot to relax with family and friends. The 25 campsites partially covered by shady trees. The nine cabins have different layouts and features to suit every customer. The glamping tents are the newest addition to Jamieson Caravan Park’s accommodation offering. For the kids and the young at heart we have a volleyball field, basketball hoop, table tennis table, swimming pool, river and lots of grass to run around on. The Jamieson area and surroundings have many options for nature lovers. Fishing, four-wheel-driving, dirt bike riding, kayaking (available for rent here at the caravan park), mountain biking, cycling, horse riding, hunting, and hiking to name a few. Nearby lake Eildon – ten minutes to boat ramp – is ideal for boating, jet skiing and many more water activities. Mount Buller – just a one hour drive away – is great for snow skiing in winter or down hill biking the rest of the year. Two bedroom cabin with ensuite, accommodates up to six people. Master has a double bed, second bedroom has two sets of bunks or a double and a single bed. This cabin has a self-contained kitchen (no oven), split system heating and cooling, television and DVD, lounge area, and a balcony with barbecue overlooking the beautiful Jamieson River. Single room cabin with double bed and two sets of bunks. These cabins accommodate up to six guests. These cabins have a self-contained kitchen (no oven), split system heating and cooling, television and DVD and are situated on the bank of the beautiful Jamieson River. There is no toilet/shower in the cabin, however the parks amenities block is directly opposite these cabins. Non-riverfront cabin that accommodates up to six guests. Master has a queen bed, second bedroom has two sets of bunks. This cabin has a self-contained kitchen (no oven), split system heating and cooling, and television DVD, and sitting area. Non-riverfront cabin accommodating up to two guests all bedding and towels supplied. This cabin has a queen bedroom, ensuite toilet and shower, self-contained kitchen (with oven), split system heating and cooling, television and DVD, and lounge area. There are 26 camp sites available for caravans and camping. The sites are grassed and level and enjoy partial tree cover. All sites are spacious. Three of the sites are directly on the banks of the Jamieson River.